Zion80’s Jon Madof sat down with Basya Schechter (Pharaoh’s Daughter) and Eden Pearlstein (aka ePRHYME) of Darshan to discuss their music, Chant Records, being a spiritual gangster and more. Stay tuned! And support Darshan on Kickstarter. Ends September 30! Previous Previous post: Shana Tova from Zion80! 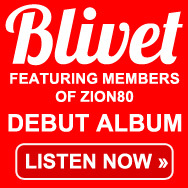 Happy New Year from Zion80! Zion80 + Golem Rock Hanukkah! Warriors – Out Now on CD!